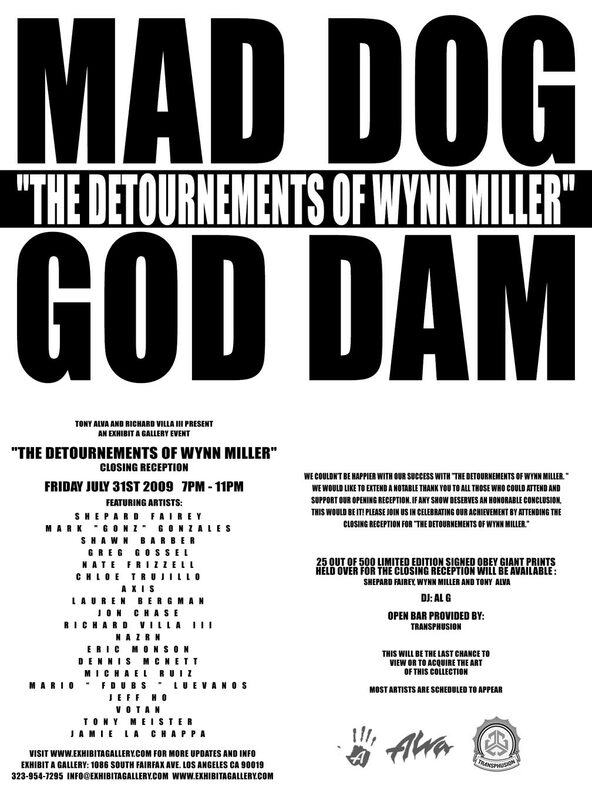 Tony Alva and Richard Villa III present an Exhibit A Gallery event not to miss: “The Detournements of Wynn Miller” Closing Reception. Taking place this Friday, July 31 the place should be popping as it is X-Games weekend. Featured artists include: Shepard Fairey, Mark “Gonz” Gonzales, Shawn Barber, Greg Gossel, Nate Frizzell, Chloe Trujillo, Axis, Lauren Bergman, Jon Chase and many more. The opening reception was so successful that they felt it truly deserved an honorable conclusion. This will be the last chance to view or to acquire the art of this collection!!! Get on it! This entry was posted in Skateboarding and tagged an Exhibit A Gallery, and Richard Villa III, Art, art show, Axis, Chloe Trujillo, free, Greg Gossel, Jon Chase, Lauren Bergman, los angeles, Mark "Gonz" Gonzales, Nate Frizzell, Shawn Barber, Shepard Fairey, Transphusion, WYNN MILLER on July 29, 2009 by Sandra Burciaga Olinger.